On Monday, April 8, Students for Justice in Palestine (SJP) and Jewish Voice for Peace (JVP) commenced the University’s Israeli Apartheid Week, which is sponsored by the Resource Center, the History Department, the Center for African American Studies, the Government Department, and the College of Social Studies, among other groups on campus. The week, which has been held annually for over five years, consists of six main events that aim to increase understanding of the ongoing conflict through the perspectives of both Israelis and Palestinians. Kauanui, who is involved in the planning of the week, noted that this year will include an especially prominent and interesting set of speakers. The variety of lectures, discussions, and film screenings makes this year’s Apartheid Week the most expansive in recent memory. In addition to these events, there will be an artistic representation of the Apartheid Wall, erected in Palestine in 2005, outside of the Usdan University Center from April 8 to 12. The replica wall, which has been handed down since 2013, is meant to be a symbol of division, as well as the artificiality of territorial lines. The thematic elements of the wall have changed over the years to meet the political moment, including an update, in 2016, to include a reference to Trump’s intended wall along the Mexican border. The organizer expects changes to the wall will be made in future iterations. The student organizer explained that University reaction to Israeli Apartheid Week has also changed since its inception. In addition to bringing attention to the ways in which cultural narratives surrounding Israel and Palestine can be narrow or inaccurate, the organizers of the events aim to redirect the conversation surrounding the conflict, pushing against divisions between Israeli and Palestinian voices. Organizers also wish to draw a separation between Judaism and Zionism. 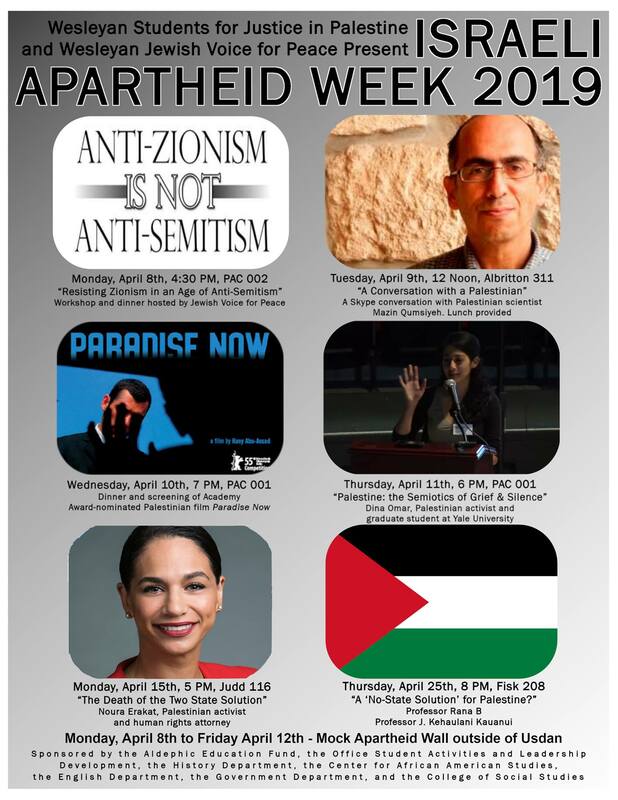 Israeli Apartheid Week will conclude on Thursday, April 25. For more information on Apartheid Week events, view the full calendar. Sigh. It’s always the same. Vilify Israel with the apartheid charge when it doesn’t apply. And then purport to be for a peaceful dialogue and solution when the true motive is the destruction of the State of Israel. SJP’s motto – “Set Palestine free from the river to the sea” clearly eliminates Israel as a country. This from the article: “The offerings of this year’s IAW at Wes are important on multiple registers, but notably because they are educational and serve as crucial forms of anti-normalization,” Anti-normalization means no normalizing ties to Israel. How do you have a peaceful dialogue and solution if you don’t recognize Israel’s right to exist. It just saddens me that this the “peaceful” approach to find a solution.